Copper nanoparticles as an efficient, inexpensive catalyst were prepared via ball milling for synthesis of β-carbonyl 1, 2, 3-triazoles from azido alcohol by click reaction in water. An extensive range of raw materials such as sodium azide, phenacyl bromide, epichlorohydrin, and terminal alkynes were used. Complete reduction of CuO in presence of NaBH4 was done via ball milling with a ball-to-powder weight ratio of 50:1 under air atmosphere at room temperature. The final copper nanoparticles (Cu NPs) were characterized by SEM, EDX, XRD and FT-IR. The Cu NPs catalyzed one-pot three component synthesis of β-carbonyl 1, 2, 3-triazoles at room temperature with short reaction time and high product yields. The catalyst could be easily recovered and reused in several successive runs. 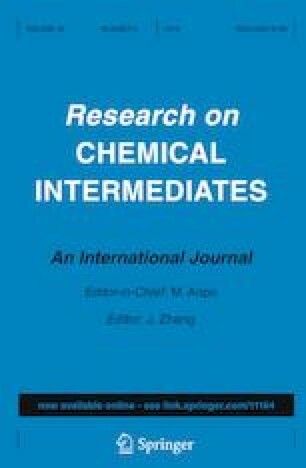 The online version of this article ( https://doi.org/10.1007/s11164-019-03773-9) contains supplementary material, which is available to authorized users. The authors are thankful to the Department of Chemistry, Faculty of Science, Ferdowsi University of Mashhad and Department of Chemistry, Faculty of Science, Payame Noor University.